A partnership with E&A means growth for your association. We love using our creativity, customer service approach, and extensive knowledge to help your association prosper. Whether we are providing administrative support, serving as your association staff, negotiating your meeting contract, or providing full-service meeting planning services, we are focused on getting you the results you deserve. E&A has managed the Virginia Society of Association Executives (VSAE) since 1995, taking them from an organization with few events and static membership to a thriving organization with healthy financial resources. 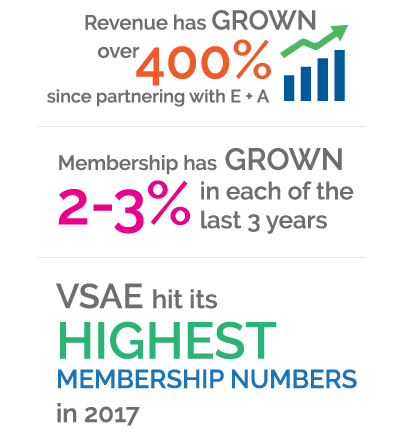 VSAE is now a model of professionalism and brand identity, and is considered an industry leader nationwide. Our strong portfolio of meetings and consultants enables us to negotiate the best rates and most favorable terms for your organization. While we specialize in Virginia and the Mid-Atlantic, we place meetings in locations throughout the United States, Mexico, Caribbean, and South America. 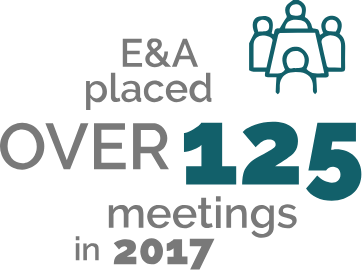 How can E&A leverage our portfolio in placing your meeting?